Extend the life of your signs by hanging them in an Acco Quartet enclosed bulletin board. 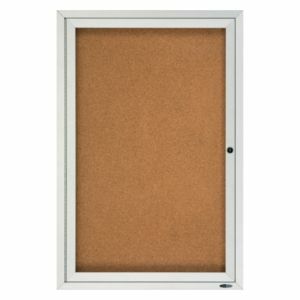 This bulletin board comes with a locking, shatterproof acrylic door allows posting, protecting and easily updating important messages. Highly durable, enclosed natural-cork bulletin board backed by high-density fiberboard secures documents with pushpins for long-lasting. Self-healing surface and high-density backing deliver maximum pin-holding power, ensuring documents stay securely posted. Satin finish, anodized aluminum frame with full-length hinges complements any interior. Acco board is specially designed security lock system secures board to wall. Order the Quartet enclosed bulletin board today! Acco Brands logos are registered trademarks of Acco Brands. All others trademarks and copyrights mentioned herein are the property of their respective owners.